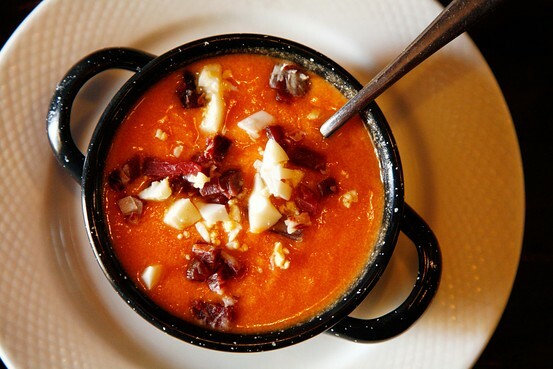 Salmorejo has become one of my favorite summer foods. It is a refreshing cold tomato soup, more filling than gazpacho, with more bread, and extremely tasty even when the tomatoes are of indifferent flavor, because of the extra-virgin olive oil, vinegar, garlic and seasonings. It was born as the simple meal Andalusian agricultural laborers made for themselves when they worked in the vegetable gardens. They brought with them a dornillo (pestle and mortar) to pound the tomatoes that grew on the spot, some olive oil, salt and vinegar to dress them, and some bread. It fills me with joy every time I make it because it brings back memories of Córdoba. Andoni Luis Aduriz, the brilliant young chef at Mugaritz in the Basque Country whose cuisine has been described as techno-emotional, told me that although he uses science and technology to create his dishes, he wants them to evoke memories and provoke emotions. “Memories and emotions” is the new mantra of innovative chefs. I don’t peel the tomatoes; in the food processor, the skin all but disappears. I vary the toppings. The Córdoba version is chopped hard-boiled eggs and jamón. In Antequera and the area south of Córdoba, where they call it porra, they add bits of tinned tuna. I sometimes add chopped cornichons, capers or chopped olives. I went in search of those memories and emotions that dishes evoke in Spaniards, and on the way discovered what they meant to me. It is surprising how dishes can appeal directly to the emotions. They say that with gastronomy, as with music, you can touch people and make them cry. When I cook at home in London, it is the people who gave me recipes and those with whom I shared meals that I think of. It is images of the flamenco concert in Córdoba, the convent where I stayed in Seville, and the cathedral in Santiago de Compostela that I conjure up. They represent an old civilization with a fabulous cuisine—delicious and exciting. I mustn’t forget that the story of gazpacho is also the story of the tomatoes that came from the New World. They were first cultivated in Seville, in the early 16th century, but extensive use of the tomato only began in the 19th century. —Ms. Roden is a London-based cookbook author and president of the Oxford Symposium on Food and Cookery. 1. Put the bread in the food processor and turn it into fine crumbs. Then pour these into a serving bowl. 2. Cut the tomatoes, unpeeled, into quarters and remove the hard white bits at the stem end. Blend in the food processor until the peel shows only as tiny specks of red in the pink cream. Add the rest of the ingredients, tasting to decide how much garlic and vinegar you want, and blend well. Then add the breadcrumbs and mix well. 3. Serve in bowls garnished with a sprinkling of the olive oil and the chopped eggs and ham. For a porra that was the mainstay of the peasantry of Antequera, blend 500g of bread soaked in water with 500g tomatoes, 1 green pepper, 4-5 crushed garlic cloves, 175mL extra-virgin olive oil, and salt and vinegar to taste. Garnish with chopped egg, jamón and flaked tuna bits.